Denver Archbishop Charles J. Chaput, O.F.M. Cap. has been appointed to succeed Cardinal Justin Rigali of the Archdiocese of Philadelphia. Archbishop Chaput will be coming to an Archdiocese that has a wealth of data on the Catholic population within its borders. Dr. Robert J. Miller, Director of the Archdiocesan Office for Research and Planning, is simply one of the best data people working in service to the Church today. There are few other arch/dioceses that do such a thorough job collecting data for planning and making this available to the community (from which we draw on to show the trends below). 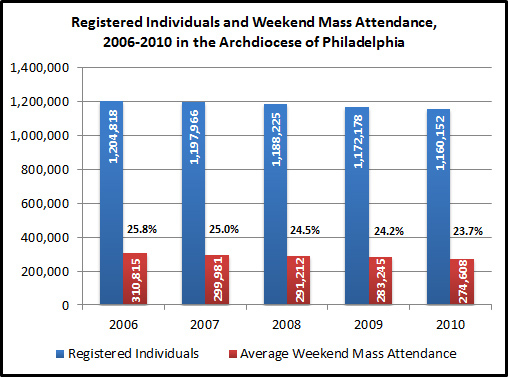 The Archdiocese of Philadelphia, like many other northeastern arch/dioceses that include a large urban area, has experienced declines in the number of registered Catholics and in Mass attendance in recent years. Yet the changes in Philadelphia have been modest in the short-term. In the last five years, the number of registered Catholics has declined by 3.7% with 44,000 fewer registered in 2010 than in 2006. This does not necessarily mean there are fewer Catholics in the Archdiocese (e.g., the Archdiocese reports a total of 1,316,220 Catholics—registered and non-registered—in the 2011 Official Catholic Directory). In CARA’s national surveys we have seen a drop in recent years in the percentage of Catholics choosing to register with a parish. Many of the 'unregistered' still self-identify as Catholic and have some activity in parish life. The rate of Mass attendance at Saturday Vigil and Sunday Masses in the Archdiocese has dropped by -2.1 percentage points from 2006 to 2010, with 36,207 fewer attenders in 2010 than in 2006. Trends in sacramental and other devotional activity in the Archdiocese mirrors national patterns with slight drops in the number of baptisms, marriages, and funerals celebrated in the Church. In 2006, there were 10.7 baptisms of minors, 3.7 marriages in the Church, and 9.6 funerals celebrated for every 1,000 registered Catholics in the Archdiocese. By comparison, in 2010, there were 9.4 baptisms of minors, 3.3 marriages in the Church, and 9.2 funerals celebrated per 1,000 registered Catholics. One of the biggest opportunities for Archbishop Chaput is in strengthening ties between Hispanics in the Archdiocese and the Church. Even as the number of registered Catholics has dropped, according to U.S. Census data 72% of overall population growth (Catholic and non-Catholic) in the Archdiocese in the last decade has been among Hispanics. CARA surveys indicate that Hispanic Catholics are generally less likely than other Catholics to register with their parish and most Hispanics in the United States self-identify as Catholic. Archbishop Chaput will be moving from the 38th largest arch/diocese (as measured by Catholic population) to the ninth largest. Yet these two archdioceses are coming closer in the population rankings over time. In the last decade, the Catholic population of the Archdiocese of Denver grew by 45 percent, while it declined by 8 percent in Philadelphia. 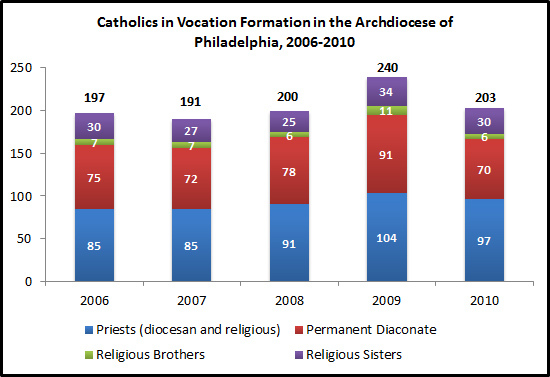 The number of individuals in formation for the clergy or religious life in the Archdiocese of Philadelphia has been relatively stable in recent years. Currently there are more than 200 people in formation. The largest numbers are men preparing to be priests (97) and men preparing to be permanent deacons (70). 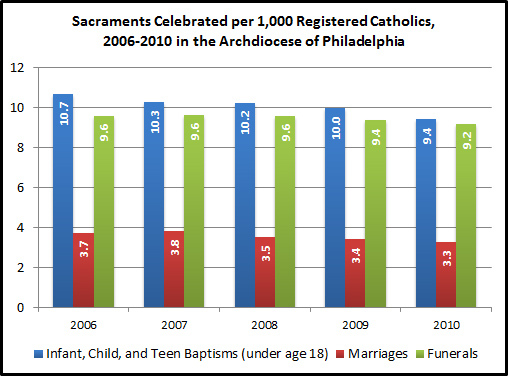 There are a few other important aspects of the Catholic faith that have also shown growth in the Archdiocese of Philadelphia in the last five years, including the number of child baptisms from ages 1 to 6 (+1%), students enrolled in Catholic high schools (+15%), the number of adult Catechumens (+9%), and the number of people participating in Eucharistic Adoration (+18% since 2007). Above photo courtesy of Steve and Sara at Flickr Creative Commons. Today, the Emerging Models of Pastoral Leadership project will be releasing the first report from their ongoing landmark study of parish life in the United States entitled, The Changing Face of U.S. Catholic Parishes. A significant piece of the first findings are on the issue of the growing scope of parish life. As the Church has closed parishes in the last decade, those that now remain, on average, include more individuals and are celebrating more Masses. These changes may begin to take a toll in the future as the study, conducted by CARA, also finds that larger U.S. parishes tend to have lower rates of attendance, lower levels of sacramental activity per household, and less giving per registered household than what is reported in smaller parishes. There appears to be a size limit at which the parish community begins to become less active and less giving. Much of the recent focus in the news on these topics has been on parish closings. For example, it has been reported that Bishop Richard Lennon has requested the Vatican to evaluate recent decisions to close parishes in the Diocese of Cleveland. Yet it has not been uncommon for dioceses in the Midwest and Northeast to close parishes in recent years (some of these are typically maintained as worship sites). Many parishes in these areas were established 70 to 130 years ago to meet the needs of new and growing immigrant Catholic populations (often speaking different languages) in urban centers. In the post-World War II era, Catholics (along with the population in general) shifted to the suburbs and South and West into the growing Sun Belt economy. As emotionally difficult as it must be to close some of these parishes, it is also sometimes necessary to do so given the maintenance costs for these aging physical plants in light of smaller numbers of parishioners and priests often being in shorter supply than they were decades ago (note I have no knowledge of the specific decisions or data in Cleveland so I cannot say whether those closings generally fit the broader patterns). An equally challenging question for the Church is how will it address the needs for all the Catholics in areas where there really never was a “local” neighborhood parish? As we have shown in a previous post, there are not a lot of dioceses building new parishes in areas where the Catholic population moved and is growing strongly. I understand there are challenges to building a new parish including capital campaigns, planning commissions, architects, and construction companies to deal with. This was all I imagine much easier to do in the 19th century. But a parish building boom will likely be needed in the U.S. Sun Belt in the 21st century. The migration trends I note above are long-term but just look at the short-term effects below of the recession on mobility for two counties. The top image is for those leaving (red) and coming to (black) the county which includes the city of Cleveland in 2008 (the source is IRS data and the image is generated from Forbes). The bottom image shows the same for the county including the city of Atlanta. As one can see some of Cleveland’s population loss has been Atlanta’s gain (note we do not know the religion of any of the individuals in the IRS data). In 2001, the Archdiocese of Atlanta had more than 320,000 Catholics, 131 active diocesan priests, and 77 parishes (note in 1991, the Archdiocese had 176,000 Catholics and 65 parishes). Moving a decade ahead, the diocese now has 900,000 Catholics, 141 active diocesan priests, and 87 parishes. Thus, the number of Catholics increased by 181% in the last decade but the number priests only increased by 8% and the number of parishes by 13%. This means the number of Catholics per parish in the Archdiocese has grown from 4,156 in 2001 to 10,345 in 2011. 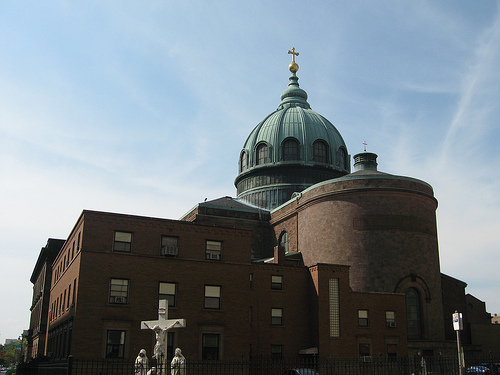 Ten new parishes have been added to accommodate 580,000 additional Catholics. I certainly do not mean to sound critical in any way of the Archdiocese of Atlanta. In fact this Archdiocese is one of the few that has added significant numbers of parishes in recent years. Thus, even where the needs are recognized and growth is occurring, the arch/dioceses doing the most to focus on new construction still tend to be a bit behind the pace of the rapidly changing distribution of the Catholic population in the United States. The Church should take great care in dealing with the future of parishes in communities with diminishing Catholic populations. The decision to close a parish must always be very difficult. Yet, it may also be time to ask, with great care as well, when and how do we open new parishes where they are needed? After moving, will Catholics always have a new Catholic home to “come home” to? In previous posts we have looked at shifts in the racial and ethnic identities of American Catholics as well as changing identifications with national ancestry groups. Within these changes is a mystery that many may not have noticed. 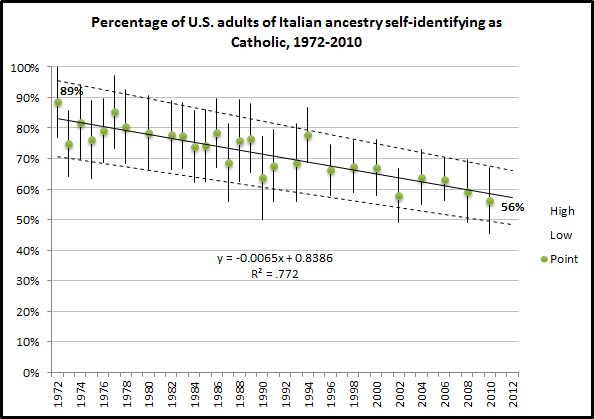 The percentage of adult Catholics claiming Italian ancestry has fallen off a bit in recent decades (from 18% in the 1970s to 13% in the 2000s). However, the percentage of all American adults claiming Italian ancestry has been relatively stable at about 5% to 6% from 1972 to 2010. Reading between the lines, the proportion of Italian Americans who self-identify their religion as Catholic must be falling. As the graph below shows, it is. This is not an easy group to study, given its overall size in the total population. Generally, samples for Italian Americans are small in the General Social Survey (GSS). However, the GSS provides repetitive independent samples that can be tracked over time. Even when accounting for margins of sampling error (the bars extending out from each data point on the graph) a clear pattern of decline is evident. If one takes the point estimates literally (ignoring margin of error for a moment), Catholic affiliation among Italian American adults has fallen from 89% in 1972 to 56% in 2010 (-33 percentage points). If you’re an optimist you can assume the higher margin of error estimates are more accurate and if you’re a pessimist go with the lows. Either way, the decline in percentage points is essentially the same. Note as this drop has occurred the overall Catholic affiliation percentage for U.S. adults has remained unchanged at 25%—where it has been for decades. Is there anything similar happening among Italians in the “home country?” No. Although the Mass attendance of Catholics in Italy has declined in recent decades, affiliation among Italians has remained in the high 80% to low 90% level (i.e., World Values Survey estimates). It is clear that the changes in the U.S. are gradual. There is no mass exodus moment in the trend. These types of trends often speak to generational replacement. This would entail older Italian Americans who self-identify as Catholic passing away and being replaced in the adult population by younger Italian Americans who do not identify as Catholic. The socialization of Catholicism among the Italian American population appears to be breaking down. It does not appear to primarily be an issue of children of Italian American Catholics being raised Catholic and leaving the faith. The retention rate (the percentage of those raised in the faith who remain Catholic as adults) for Italian American Catholics is actually quite high and has fallen more slowly than the overall U.S. Catholic retention rate. 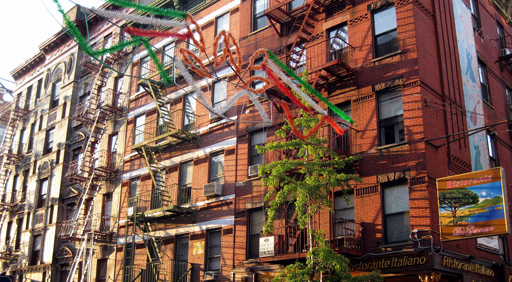 In the 1970s, the Italian American Catholic retention rate was 88%. This dropped a bit to 85% in the 1980s and a bit more, 82%, in the 1990s. Yet, even in the 2000s it averaged 77% (the retention rate for all Catholics in 2010 was 68%). The fall in the Italian American Catholic retention rate is not as extreme as the drop in Catholic affiliation for Italian Americans in general. Instead, some Italian American Catholics must be choosing to raise their children in another faith or no faith at all. Why would this happen? I think (just my opinion; no real data) it has something to do with many post-World War II Italian Americans moving out of the “Little Italies”—those urban ethnic enclaves of their immigrant ancestors and into the suburbs. Here they were less likely to be around other Italians and/or Catholics and became less connected to Italian culture, language, and tradition (CARA parish surveys indicate the number of Masses celebrated in Italian have dropped by a half or more in the last decade). Data on the religion and ancestry of the spouses of this sub-group of the population are hard to find (i.e., even smaller samples). What is available does indicate that Italian American Catholics are increasingly likely to be married to spouses who do not share their faith. Many of the Italian American Catholics who left the old neighborhoods are no longer with us, but their kids and grandkids are. Some of them don’t share the faith of grandma and grandpa. In the 1970s, only 11% of Italian Americans self-identified their religion as Protestant. In the 2000s this had nearly doubled to 19%. A similar increase in the non-affiliated or “Nones” has occurred, with 7 percent of Italian Americans self-identifying as Nones in the 1970s and 14 percent identifying as such in the 2000s. Again these changes exceed the pace of the drop in Italian American Catholic retention so it’s not primarily and issue of leaving. Instead it’s a story of a faith failing to be reproduced among this ancestry group. The mystery is by no means solved and I’m no detective, but these are my deductions and data on this topic so far. Regardless, as the grandson of an Italian Catholic grandmother (the family name was Filippini) it makes me sad to see the link between this ancestry group and the Catholic faith weaken. Above photo courtesy of nmcbean at Flickr Creative Commons.